Why is there such a strong street art scene in Melbourne? It’s a combination of geography and good luck according to University of Melbourne Professor Alison Young, who is currently undertaking an ARC Discovery Project examining the reception of street art in the cultural field. 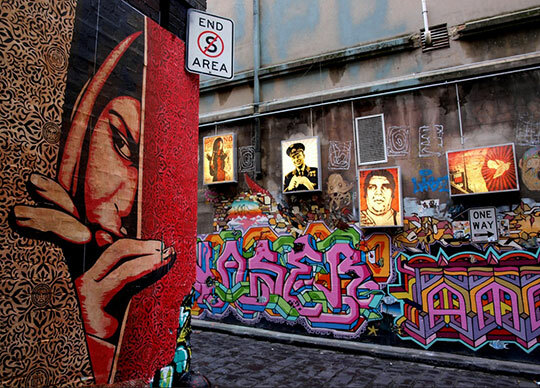 “In terms of geography, Melbourne’s streets and laneways mean there are plenty of areas (where) people could put up street art without being highly visible,” she says. As for luck, Young notes that as the recognition of early Melbourne street artists grew, others came to live here to take part in a growing scene. As street art has grown more popular big business has taken notice. Sponsored wall painting and street art walking tours are just some examples of how street art and commerce now collide. But Young cautions against being too negative about street artists “selling out”. “It is important for artists to be able to live from their art,” she says. Where Melbourne’s street art scene is going is anybody’s guess. But she also notes that there are plenty of street artists who ignore the lure of the art world, tagging just to get a kick out of showing their style on the walls of Melbourne. Street artist and law alumna Kaff-eine discusses her art here. Five key moments in street art history.